Before diving into straight-up rose soliflores this week, I’m focusing on some non-traditional rose perfumes. 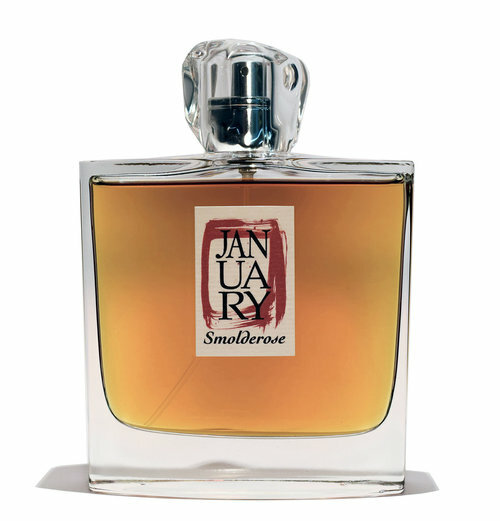 January Scent Project Smolderose is one of those perfumes that borders on the line of “is this or isn’t this a rose”. I mean, why would something be called Smolderose if there were no rose, right? Years ago, I somehow found myself with an educator from a large fragrance/flavor supplier. It was an amazing experience because I was able to smell these raw materials on their own. Knowing I love roses, they wanted me to smell all of the concentrations of their most expensive rose…one where it takes like a gazillion pounds of rose petals picked by the hands of maidens and grandmas to make just a drop of some sort of sticky rose concentrate. This was a turning point in my perfume writing and understanding of roses. Rose oil in a very high concentration smells sort of gross. It smells like motor oil, gasoline, hay and almost like an animalic leather. It wasn’t “rose”. With each dilution, I was able to identify something more rose-y. I could pick up on the nuances of grapefruit or raspberries. I actually found the weakest (and cheapest – but still crazy expensive) the most palatable. Why did I just tell you that story? Well, because I think it’s important to know how complex a rose is and how it’s influenced by its concentration, distillation and even its origins! Knowing one rose isn’t knowing them all. I also bring this up because roses aren’t always “pretty”. I was shocked by how something natural could smell so, for lack of a better word, industrial. Here was a natural rose, nothing synthetic about it, but it smelled industrial. If anything, I feel like Smolderose is the best example that I know of in perfumery that displays that weird motor oil/gasoline, leather-y aspects of rose oil that I smelled that day. Now back to the review…the heart is still that rose in a green pasture…next to a highway. As it wears, the rose becomes mintier but also shares an aspect of like dried apricot/apricot “fruit leather”. The more it wears, the fruitier the rose gets. I once had some sort of cocktail that featured St. Germain, rose jam and gin (I think). This is what I’m reminded of when I smell Smolderose at this stage. Now let’s get to the smolder. The last part of the wear is a smoky rose. The rose petals become dry. There’s balsamic incense. There’s woods, juniper and smolder. With the balsamic resins, smoky cade and something that reminds me of Texas cedar, I’m reminded of the drier regions of the Texas Hill Country. Something about this base is like brush, tar and wildflowers. Also, there’s a lot of leather. So, let’s add saddles and cowboy boots to the mix. It’s bitter, smoky, woodsy with a hint of florals. Give Smolderose a try if you like the idea of a rose that isn’t so “rose” or if you like weird florals. Or perfumes like Nasomatto Baraonda, Providence Perfume Co Rose Bohème, DSH Perfumes Dirty Rose, Histoires de Parfums Édition Rare Rosam and/or LUSH Flower’s Barrow. I think if you like brands like Slumberhouse, Tauer or LUSH, I could see you digging this perfume. This is one of those roses that leans more “masculine” (especially in comparison to the one that I reviewed yesterday from L’Occitane) but it’s unisex (like all perfumes). Projection and longevity are above average. There’s also a perfume oil of this which I understand smells different. I have not tried it so I can’t compare the two. The 3.4 oz bottle retails for $125 at Indigo Perfumery. Samples are also available for purchase. *Sample obtained by me. Product pic from the brand. 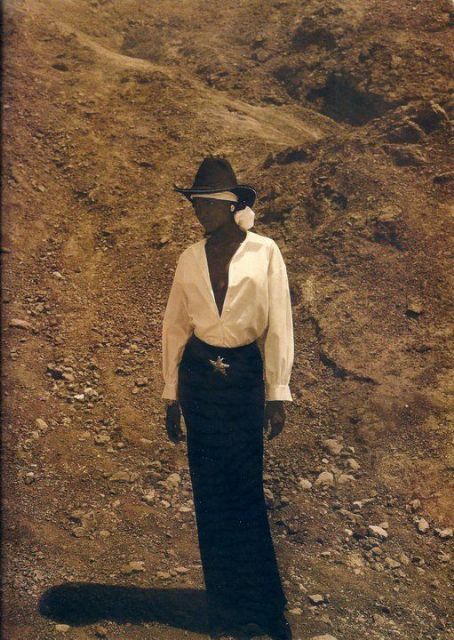 Beverly Peele photographed by Michel Haddi for Vogue UK 1990 pic from Vogue. So happy to see you reviewing this! A few months ago I ordered their sampler and was (1) amazed at the incredibly beautiful packaging (2) really impressed by the stunning artwork and (3) so happy that interesting, complex well made fragrances are being made! And thank you for writing about your experience with rose oil! I’m really happy to be trying these. I have samples of the others but haven’t tried them yet. A friend gave me her sample set because she thought I’d really like them (she does and was hoping I would too). I really look forward to trying the others. As corny as it sounds, this one reminds me of reading a novel (how it progresses). So, yeah, I’m impressed! Yay, Fille de Berlin! I love that one too and its red juice. It’s such a delight. Well, I don’t think you’re going nuts! I also pick up on almost industrial-y accords. When I pick up on rose, it’s not a huge obvious rose (on me). I wouldn’t call it jammy but maybe I’m being too literal (my jammy reviews are coming later this week). Anyway, I like it and it’s an odd thing but it really had me thinking about perfume and it sort of swept me away to somewhere else. And keep on blogging, Claire! It’s funny you mention McMurty because I was just thinking about that Lonesome Dove series not too long ago (mainly because of Brown Recluse spiders, don’t ask, lol). But, yes, I can totally see this and Tauer’s Lonestar Memories fitting with the landscape of McMurty’s books/screenplays. Anyway, it’s an interesting perfume that mixes in the rugged with the polished. I don’t know if I see myself wearing it but I have really loved sampling it. It really got my imagination going. Good luck on the big move! We’ve done that a few times. It’s never easy but I think it’s well worth it. Also, I understand the avoidance. I avoid so many makeup-related hashtags on Instagram because I’m weak. It is just best for me to avoid it altogether. Hey Kate, just wanted to.say the sample set is a good deal price-wise and has some beautiful postcards, too! It’s an interesting line. Thanks Karen! Sadly I must have overlooked the sample set and ordered the samples individually. I would have loved to have seen those postcards, but at least everything will still smell the same. The postcards must be good because I didn’t know they existed! My friend parted with the samples but not the postcards, lol. Thanks for the well-wishes on my move Victoria! And I just thought I’d let you know I ordered all the samples of January Scent – it seemed ridiculous to buy and ship just one little sample. See what I mean? No restraint! But they all sounded intriguing to me. I do look forward to trying the others. They sound good. I think you’ll like Selperniku: creamy sandalwood with apricot, lots of transient herbaceous woodiness that’s hard to describe. Not overly friendly at first (which keeps it from being dull), but it becomes more of a comfort scent over time. Equal measures of push/pull, repel/attract. JSP is making great scents: artful but approachable. I haven’t tried it yet but it sounds so good. I look forward to trying the rest of the line.